Excerpted from an article appearing in The Horn Call XXVI, no. 3 (May 1996): 27-36. Marvin Howe, this singer of smooth melodies, was born February 26, 1918, in Fort Wayne, Indiana. He was educated in the public schools and graduated from Harding High School in Marion, Ohio in 1935. A lifelong scholar, Marvin's collegiate studies began at the Oberlin Conservatory--where he was the first person to earn a Bachelor of Music degree in Horn in 1939. He also earned from Oberlin his bachelor's degree in School Music in 1940, (Phi Kappa Lambda). A college roommate at Oberlin--Fred Myers--later became the father of the Principal Hornist of the New York Philharmonic--Philip Myers. His horn teacher at Oberlin was a member of the Cleveland Orchestra--William Namen. Also, he was influenced by other members of the Cleveland Orchestra at that time--Martin Morris and Philip Farkas. After college, his early career was teaching instrumental and vocal music in public schools in Lexington, Ohio, and Glens Falls, New York, before volunteering to serve in World War II. He was a band director in the U.S. Army--serving as a warrant officer at the Army Music School in Arlington, Virginia, and also in the European sector until 1945. During the time Dr. Howe was in the Army, he was stationed at Fort Benning, Georgia, before being sent to Europe. Before entering the Army, Dr. Howe did graduate work at the University of Michigan (1941). However, after returning from Europe, he studied at the Juilliard School of Music and Columbia University in New York City in 1946. While at Juilliard, he studied with New York Philharmonic hornist Robert Schulze. 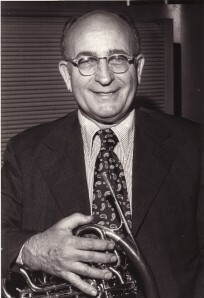 From 1946 to 1948, Professor Howe taught horn and brass instrument pedagogy at Ithaca College, while completing his Master of Science in Music Education there in 1948. At Ithaca, he worked with trumpeter and brass pedagogue Walter Beeler. Marvin's Method for French Horn was begun at that time-and he often credited Beeler-who was writing his Method for Cornet at the same time-as a particularly helpful consultant. From 1948-1953, he taught at The University of Illinois. As an important center for the study of contemporary music, The University of Illinois brought him into contact with several prominent composers. He performed works such as the Paul Hindemith's Sonata for Horn and Piano (1939) and the Igor Stravinsky's Dumbarton Oaks Concerto under their direction there. The Maine Sketches for Horn and Piano (1952) by Eugene Weigel was inspired by Weigel's hearing Marvin's low register exercises in a nearby studio! After taking a year off to take care of the family farm in Ohio, Marvin moved his family to Cedar Falls, Iowa, where he became an Instructor of Music at Iowa State Teachers College. In addition to teaching horn, brass instruments, and pedagogy, Marvin toured the State of Iowa as a consultant for music teachers. A performance with George Waln's Woodwind Quintet on a Post-Camp NACWPI Conference at Interlochen, Michigan in 1956, led to his employment at The National Music Camp in 1957. Soon, Interlochen became the summer home for his wife-Arline Howe, his daughters-Nancy and Peggy, and his son Michael. While teaching at the National Music Camp, Dr. Howe touched the lives of many students who are now performing in major symphony orchestras, teach in major universities, and actively support the fine arts throughout the world. From 1960-1962, he did further graduate work at The University of Iowa. After completing is Master of Fine Arts Degree and residency for the Ph.D., he was appointed Principal Hornist of the Syracuse Symphony and Professor at Syracuse University in New York. The next year, he accepted an invitation to return to teaching at Ithaca College in Ithaca, New York. At both Ithaca and Syracuse, he performed as a hornist with the faculty quintets. Nineteen sixty-six was an important year for Professor Howe for two reasons: first, he completed the final dissertation requirements for the Ph.D. at The State University of Iowa (his dissertation, "A Critical Survey of Literature, Materials, Opinions and Practices as Related to the Teaching of the French Horn," stands as an important survey of horn teaching today--and an important critique of the state of horn pedagogy as of 1966) and second, he moved to Michigan to teach at Eastern Michigan University. The State of Michigan, then, became his home--teaching at Interlochen during the summers and at Eastern Michigan University during the winter months. Upon retirement in 1979, he moved to Interlochen, and then finally to Traverse City in 1993. Dr. Howe loved to teach! Whenever the opportunity would present itself, he would be there. When his friend Philip Farkas had a heart attack in 1978, he flew to Bloomington, Indiana, on weekends to make sure the students received their lessons. Later, in 1982, he taught for James Winter at the California State University-Fresno during Dr. Winter's sabbatical leave. Later, when officially "retired", he would give clinics, lectures, and recitals, as well as conducting the horn choir at Interlochen. His energy was remarkable! Marvin was an active and avid member of The International Horn Society. 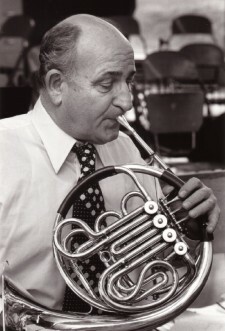 In addition to contributing to The Horn Call, he served on The Advisory Council, and performed and/or presented clinics at International Horn Workshops in Canada (1975), Provo, Utah (1987), Potsdam, New York (1988) and Texas (1991). In 1990, he was honored with the Society's Punto Award, and in 1994, he was elected to Honorary Membership in the International Horn Society. However, as much as his "official" duties, he enjoyed the camaraderie of the workshops and the chance to be a participant. He and his wife Arline provided support to performers, encouragement to exhibitors, and fellowship to hornists young and old alike. Workshop cafeteria meals were a time to meet friends and revel in the development of his many former students. In addition to the opportunity to see colleagues and hear former students, he relished the chances provided by workshops to learn new truths, rediscover old truths, and to affirm important values. Some of these are documented in his Horn Call article: "Thoughts Triggered by the 1993 IHS Convention, Charleston, Illinois." In 1988, the Marvin Howe Horn Scholarship Endowment Fund was created by former students of Dr. Howe. Those interested in contributing to this fund in honor of Dr. Howe may contact the Director of Advancement, Interlochen Center for the Arts, Interlochen, Michigan 49643. Ph. D. Dissertation--A Critical Survey of Literature, Materials, Opinions, and Practices and Related to the Teaching of the French Horn (1966), University of Iowa. Notes on the Horn --1967 published in The Horn Call XXII, no. 2 (1992): 53-55. Stopped Horn-- (1968) Treatise. Excerpt published in The Horn Call IV, no. 1 (1973): 19-24. Refinement of Tone Quality--paper presented at the 23rd IHS Symposium, University of North Texas, 1991. Thoughts Triggered by the 1993 IHS Convention, Charleston, Illinois. The Horn Call XIV, no. 1: 75-76. Howe's Handy Hints for Stopped Horn--Unpublished article. Method for Horn-- Volume 2. Unpublished. Divertimento No. 8--W.A. Mozart arranged for Horn Quartet published by Southern Music Co.
Exaudi Deus--Orlando di Lasso arranged for Horn Quartet published by Southern Music Co.